if they could find a way to ship them without dents tins would be second for me to glass, for my favorite type, for all the reasons you listed. but all the dents bother my ocd more. i mean one little ding is not to bad but recently i have got most of my tins in basically mangled and many were heavily wrapped in bubble wrap so they had to have been dented before they were shipped. i even had to remove one recent one from the tin and put it in a tub i had here because it was so bad i could not easily get the top screwed back on and i tried to kind of smooth it out a bit. (09-30-2015, 05:52 AM)shevek Wrote: I used to prefer tins for their presentation, but have grown to dislike them for both the ding issue as well as rust developing in the threading of screw top tins or under the lids of slip on tops. I had this experience with PAA tins. I was very disappointed but contacted them and offered to send me two new soaps with their new tins, that don't present rust problems. I have not used them yet, but they differ. I have also two other tins, LPL and Lea Classic cream, that are in perfect condition. Lea's tin must be aluminium made. 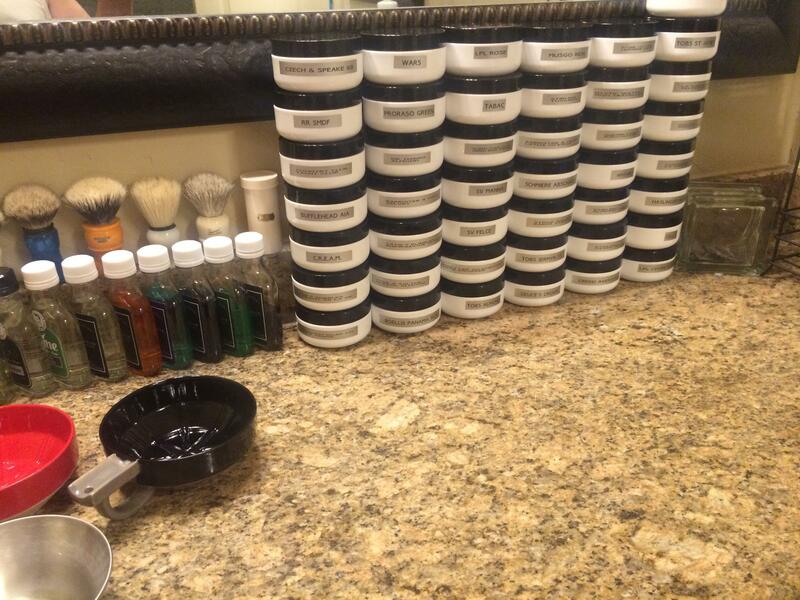 (09-30-2015, 08:08 PM)Bruce Wrote: How the heck did we get here, talking about dented shaving tins? Some people have their own agendas, go figure. I like cans too. Prefer big cans as they fit my hand better but little cans are fine too. I agree. I like big cans with a lot of product. Specially if the product is soft and perky, bring all those cans Wesley! (09-30-2015, 08:32 PM)hrfdez Wrote: Some people have their own agendas, go figure. Now we're cooking with fire. I could talk about cans all day. Sometimes I daydream about 'em. (10-01-2015, 04:35 AM)kwsher Wrote: I like cans too. Prefer big cans as they fit my hand better but little cans are fine too. Love the cans, I find myself admiring cans all the time in public and just thinking of the possibilities of said can. I prefer a bigger can with more product too. However if the can is small and packaged right then that's a nice can too. Presentation is everything IMO. Only thing about the can is when it gets some age or some use on it it could get a little bent out of shape,have some dings or dimples in it too. Regular can maintenance though will lead to years of good presentation. (10-01-2015, 10:33 AM)hrfdez Wrote: I agree. I like big cans with a lot of product. Specially if the product is soft and perky, bring all those cans Wesley! (09-30-2015, 08:18 AM)kwsher Wrote: I also like the B&M tubs. Of the actual tins that I have CRSW are nice to use, look great and always arrive in pristine condition from my experience.